Note: The Book on Foreclosures, a practical book that discusses the different aspects encompassing foreclosure, written by Bao Tran will finally be launched in the market. The Book on Foreclosures, a practical book that discusses the different aspects encompassing foreclosure, written by Bao Tran will finally be launched in the market. The said book is geared towards helping millions of homeowners and start-up investors who are in trouble with mortgage payments by providing valuable and helpful advice and tips. In the real estate industry, foreclosure is a dreadful term for homeowners who are on the struggle to keep their homes afloat. Over the past few years, there has been a notable increase in foreclosed homes all over the United States. Experts cite ignorance on how to make the right financial decision when it comes to credit, investments and mortgage refinancing as one of the major reasons as to why the number of foreclosed homes keeps on increasing. To help people cope with the curve balls thrown by mortgage payments, Tran decided to publish The Book on Foreclosures, touted by New York Times bestselling author, Raymond Aaron as the “Bible on foreclosures”. According to Aaron, the said book is compelling and easy to read because the ideas and key points are presented in an orderly and clear manner. He also claims that it provides little known tricks when it comes to postponing or avoiding foreclosure by means of lowering monthly payment. “I have read books on foreclosures before, I have read books on loan modifications, I have read books on bankruptcy, and I have even read books on how to rebuild your credit post-foreclosure. But I have yet to find a resource that ties all of this information together into one compelling and easy read…until now”, Aaron said. The aforementioned chapters provide a step-by-step guide on how homeowners and investors can make their plans happen by simply making wise decisions. They also share secrets in a particular domain within the financial and banking industry to provide readers the latest updates in the real estate industry. Readers will also be taught on how to lessen the downside and reverse their credit when the foreclosure has become completely unavoidable. According to Tran, those bonuses will help homeowners and investors understand more the blur points in the mortgage and foreclosure aspects. With the positive feedbacks to The Book of Foreclosures, it is expected that more homeowners and investors will get their own copy of the said book after its official launch. The Book on Foreclosures is considered as the most comprehensive, clear and helpful book that will provide both homeowners and investors the chance to make wise decisions in order to avoid foreclosures and to deal with their problem in mortgage payments successfully. It is loaded with proven tips and information that will provide cutting-edge information to keep a property afloat in spite of the threat brought by foreclosure. 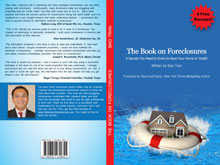 For more details about the things that The Book on Foreclosures has to Offer and its bonuses, interested individuals are advised to visit the website at http://www.thebookonforeclosures.com.